Let’s face it, running a marathon isn’t something you suddenly jump out of bed and do one day, nor is it something that 99% of people could even contemplate doing. Running a marathon, be it a full or half marathon requires you to a structured training approach to the ‘big day’. Failing to prepare may mean you could seriously injure yourself or face the embarrassment of not making the finishing line. 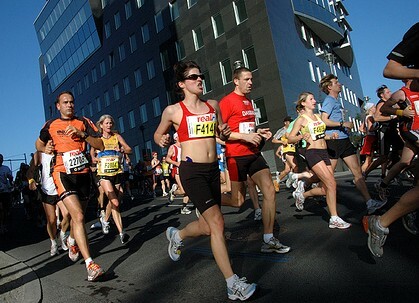 There are many different styles of running, which use different muscle fibers, training methods, running techniques, and all of these need to be considered when preparing for a marathon. Preparing for a marathon requires you to reach a state physically, and almost more importantly mentally, where you feel you can finish the marathon with comfort. Many of us have agreed to take on some kind of endurance event in the heat of the moment, with a few mates around the table, having never run any further than the local shop. If this is you then keep reading, if not go to ‘The Long Run’. Long distance running utilizes what are known as the slow twitch fibers in your muscles; basically, the fibers which allow your muscles to work under endurance. Starting your training off with 2 weekly sprints of 10 minutes is not a good way to start training these muscles. If you have never run before, start with the some fairly long distance brisk walks to start training the lungs and muscles together. As you get fitter increase the intensity into a light jog, until you can comfortably run the 6 miles. Get yourself some proper running shoes! If you haven’t already get some proper running shoes, fitted professionally. A proper fitter will assess your running style and find a shoe which suits it. Don’t be afraid to spend, it’s going to cost you far more when you knacker your knee’s out with bad shoes. Once you have established a good level of fitness start going for longer runs, approximately 16 miles or so. These need to be done in one session and you should only do them when fully rested and ready. The important thing to note with long runs is to slow your pace down. Take your normal 1 mile pace and add another one minute to one minute and a half to it for long runs. Long runs will be mentally and physically challenging. Make sure you are well rested before each run, experiment with which foods and drinks suit you and help you through each run and remember to stay loose and persevere through each one. As you get better extend these long runs to 20 miles. Someone who does this once or twice a week before a marathon date will be less likely to experience ‘the wall’ during the marathon, or at least know what and when to expect it. Training for a marathon is all about steady progression. You need to learn about and understand your body before attempting a marathon, and your training gives you a chance to experiment with this. Remember, don’t overdo it and don’t lose sight of your end goal, anyone can run a marathon when they put the time and training into it. Project Active are Oxford Personal Trainers that specialize in group fitness and personalized weight loss plans. This entry was posted in Olympics, Other and tagged endurance event, exercise, fitness, health, healthy-living, Jogging, marathon, marathon running, muscle fibers, slow twitch fibers, sports, sports and leisure, Sports Archives, sports performance, training, training methods, weight loss. Bookmark the permalink. Being prepared for a long run is not really easy, you need such motivations for workouts/training before the big day. Thanks for sharing this to us and looking forward for more updates.